Here is a link to their page and the new sales demo video. So the good: color balance modes, better battery. New lens, better in low light. smaller. times. Nothing hits me as a wow I need to go buy this now. portrait above just like the forgettable Hero960. The one thing I'm most excited about is the new protective lens. Sports shots, so I guess this is the target market. There was not one time-lapse shot, RC or other use shown. another manufacturer makes the camera I want. Is there a GoPro Hero 4 on the way? predictions and wishes for GoPro's next offering. No way to know what is really coming down the pipe. cameras everywhere, and they will be tiny. My wish list this time for GoPro? 1/4 20 mount on camera. Manual control or AE exposure lock. 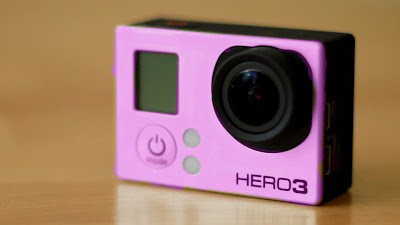 or even a Hero3 Pink.